Vivek Mahbubani: Singapore round 2 in Arabic!? Singapore round 2 in Arabic!? Wow! Wasn't I just in Singapore? Well in just over 1 week, I'm heading back but this time for round 2 of SINGAPORE COMEDY FRINGE 2015! So other than that, the last 10 days have seen me get back to HK, go crazy, suffer some insane cramps on my right leg (which I kinda fixed up with proper massage and rest) and basically me somehow needing late night binges on salty snacks. Yes, it's been a very mad last 10 days, but with the festival ahead, it's going to just get wackier. 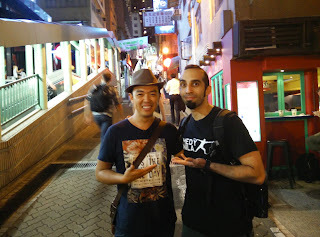 Speaking of wacky, I bumped into an Arabic-speaking Korean/Vietnamese comedian in Hong Kong as he was filming a travel show. He is literally my mirror image in the middle east where he is as local as you get but can totally get away with it because no one would expect him to be able to speak Arabic! This, was worth a photo. 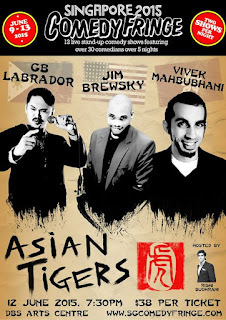 After watching Gabriel Iglesias' Youtube video about his standup comedy stint in Saudi Arabia I had tried to imagine how good humoured the Middle Eastern audience was. Some of them here are quite serious since racism and misunderstandings can be particularly rife in Australia (depending on the location). This video really shows how much they laugh and good humoured they are despite them being so conservative. Yep, it's very bizarre where your idea of what a place would be like vs the reality of it. I never realized how PC Melbourne would be until I was experiencing it. Not saying what's right or wrong since I believe it's more like you can't say it's wrong for an Indian to eat with their hands because you were brought up thinking spoons and forks are the way to go...but it's very interesting.